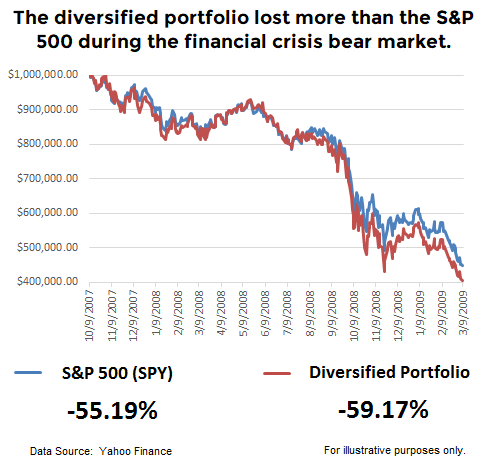 WILL A DIVERSIFIED MIX OF ETFS and/or Mutual funds save me in a bear market? The diversified portfolio below was described on a major and well-respected investing website as the "quintessential equity portfolio mix" that provides "enormous diversification". According to the article, the diversified mix below was the "best method to invest in stock markets around the globe for long-term growth". The mix was described as being "based on top-notch research and more than 45 years of experience". We do not dispute the claims made in the article. However, it is important to know the potential downside when investing in any diversified growth portfolio. Therefore, it is prudent to ask how did the portfolio above perform during the 2007-2009 financial crisis? The term diversification implies some measure of reduced volatility during large drawdowns in the S&P 500. Rather than adding value during a major bear market, the portfolio above performed worse than a buy-and-hold investor using an S&P 500 Index ETF (SPY). During bull markets, a portfolio of ETFs with a high correlation to the S&P 500 will perform well. Conversely, during bear markets a portfolio of ETFs that are highly correlated to the S&P 500 will perform poorly. 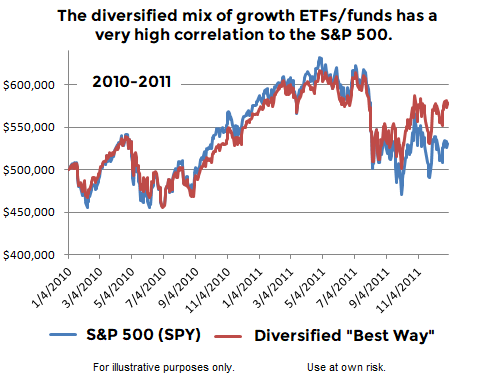 The chart below shows the diversified growth portfolio's correlation to the S&P 500 in 2010-2011. As you can see, the two basically zig and zag in unison.